Throughout history men and women alike have loved to adorn themselves with beautiful gemstone jewelry. Gemstone jewelry is jewelry made with a rock, mineral or petrified substance that is cut and polished to provide a beautiful appearance. It is a gemstone's beauty that differentiates it from other rocks and makes it desirable to jewelry lovers. The stones are usually mined from the earth, then cut and polished to prepare them for sale. Some gems are treated to enhance their beauty. For example, brown zoisite is heat treated to produce the attractive blue gem tanzanite, and emeralds are frequently treated with oil, wax or resin to make surface flaws less noticeable. Traditionally, gemstones were referred to as precious and semi-precious. There were only five precious stones - diamond, ruby, sapphire, emerald and amethyst, and these were typically the most costly of gems. The first four still tend to be more costly, however large mines of amethyst were discovered in South America, which has made this gem much more common than it once was. Before being set in jewelry, most gemstones are first cut and polished. Facets are cut into the gems in order to reflect light and give the stones the sparkle for which they are known. Alternatively, gems can be cut into a rounded, smooth, cabochon shape. Opaque gems, such as opals, are typically cut into cabochon shapes, while transparent stones are usually faceted, though they are sometimes cut into cabochons as well. Popular cuts vary due to period, as well. The cushion cut, for example, was a prime choice for Victorian era-jewelry. Once cut, the stones are polished to prepare them for use in jewelry. Historically, gemstones were believed by many people to have certain qualities that would be bestowed upon the person who wore them. Rather than choosing jewelry based on what went best with their clothing, these people chose according to the gemstone's mystical power. For example, people who wanted to draw money to themselves might wear green emeralds, while those looking for love could choose rose quartz, and those hoping to party the night away without a hangover might sport amethyst jewelry. Ever-popular birthstones are a favorite type of gemstone jewelry. Each month is associated with a different type of gem, which is called the birthstone of anyone who was born during that month. Some months have two or even three birthstones associated with them. Birthstones include both precious gems, such as diamonds and rubies, and semi-precious stones, such as turquoise. Birthstone jewelry makes an excellent gift for a friend or loved one, especially for Christmas, Valentine's Day and, of course, birthdays. Mother's and grandmother's rings are a unique type of gemstone jewelry. 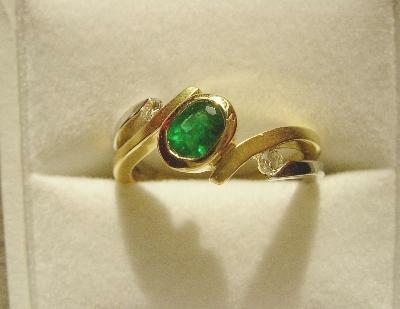 A mother's ring is set with the birthstone of each of a woman's children, or grandchildren in the case of a grandmother. These special rings have great sentimental value and are wonderful presents for Mother's Day. There is a huge range of prices for gemstone jewelry and many factors for determining cost. Quality is one such factor, with clear gems generally being more valuable than cloudy gems with visible flaws. 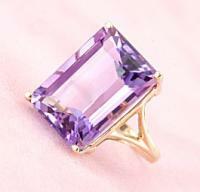 For certain gems, color is another factor, with some shades and colors considered more desirable than others. Rarity is another factor, and gemstones that are harder to find are often more costly, though this is not always true. For example, large amounts of diamonds are mined each year, yet good quality diamond jewelry is quite expensive.